Produced by special technology: without browning, no sugar, no preservatives. Contains 30% Jerusalem artichokes. Thanks to its rich chemical composition, plenty of fiber, protein, high in inulin, artichoke has therapeutic and prophylactic properties. Jerusalem artichokes, peeled roasted peppers, tomato paste, sunflower oil, salt, spices. Jerusalem artichokes is a plant with a high content of insulin. Its main advantage compared to other natural sources of inulin / dandelion, chicory, etc. / Is based on several facts: fit for direct consumption . ; prepared by artichoke dishes are delicious and also possess healing properties; suitable for processing and use in various sectors of the food industry; inulin content is higher than the other plant species, up to 70% of dry matter; topinambur has a unique chemical composition and with biologically active substances it contains, gives the products made of radioprotective and immunomodelling action. 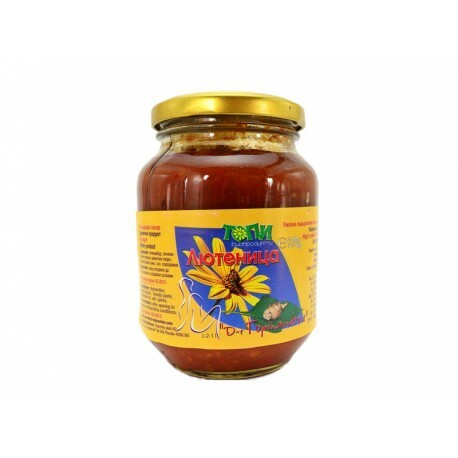 This product is fully labeled in Bulgarian and has all the necessary documents and certificates for sale on the territory of Bulgaria and the European Union.